growing up, fridays were always take-out pizza night. a night to relax the rules, rent a movie, and laze about on the sofa. no vegetables required. the whole of the weekend just stretching out ahead of you, full of promise. this is a slightly more grown-up pie than the little cesar's extra pepperoni. but it hits all the right notes, salty and sweet toppings, chewy and crispy crust. 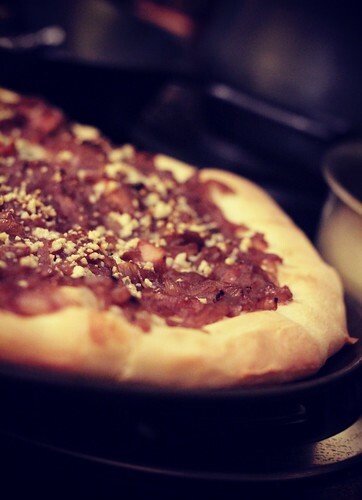 making the pizza yourself is just as easy as ordering take-out – i promise. especially if you ditch the overly complicated dough recipe in the baking with julia cookbook. i tried it – and i tried to be fair. but, ugh. kneading. rising. if i was faced with that everytime i wanted homemade pizza, i'd just buy the very very good dough from trader joe's. people. it is so simple. flour. salt. yeast. this recipe uses sugar, but there's really no need. mix in the morning while your coffee is brewing. cover, and it'll be perfect and ready for you when you get home. add toppings. bake. enjoy. capiche? i won't pretend that onion confit is a friday night activity. it's time intense, but worth it to get the onions simmered down to a jam-like consistency. sweet with a hint of acid from a splash of red wine. a perfect complement to a scattering of blue cheese crumbles. try that on a sunday, recapture a bit of the beginning of the weekend indulgence. i won't tell. Like I said, there are easy pizza dough recipes that do just as well – or better – than the one in the book and don't require multiple steps. So, I'm just going to link to my favorite. Jim Leahy. The man knows his dough. To read more, go to Tuesdays with Dorie or Boy Can Bake. 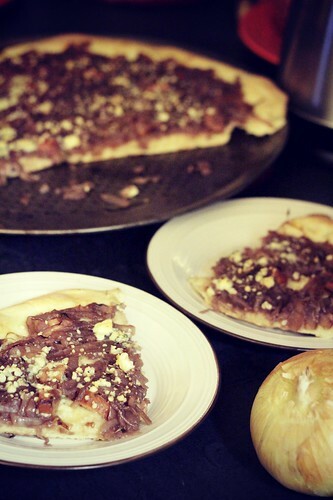 Notes for the linked recipe – you can use less yeast if you give the dough all day to rise. You don't need to bother with the sugar. Melt the butter in a large heavy skillet and stir in the onions. Season with salt and pepper, stir, cover the pan, and cook the onions over low heat until they are soft, about 5 minutes. Sprinkle the sugar over the onions, stir, cover, and cook for another 5 minutes. Add the thyme, 1 1/4 cups red wine, the vinegar, and a tablespoon or two of the creme de cassis, if you want to use it. Stir well and cook the mixture over the lowest possible heat, stirring from time to time, for about 1 hour, until just about all the liquid has evaporated. If the liquid has cooked off in half an hour or less, add a bit more wine. Turn the onions out onto a flat plate and let them cool to room temperature. The onions can be made up to 2 days ahead and kept covered in the refrigerator. They should be brought to room temperature before they’re spread on the pizza. Position a rack in the lower third of the oven, fit the rack with a baking stone or quarry tiles, leaving a border of at least 1 inch free all around and preheat the oven to 475o F. Rub a baker’s peel with cornmeal and set aside until needed. Shaping the Dough Turn the dough out onto a lightly floured work surface (snip off a small piece of dough to save for the Mixed-Starter Bread if you want) and divide it into two pieces. You’ll probably have to bake the pizzas one at a time, so keep one piece covered while you work with the other. If you do not want to make two pizzas at this time, wrap one piece of dough tightly in plastic and store it in the refrigerator, where it will keep for a day or two, or wrap it airtight and freeze for up to a month. Thaw frozen dough, still wrapped, overnight in the refrigerator. Bring the chilled dough to cool room temperature before shaping. Shape the dough into a ball and then flatten it into a disk. To form the pizza, you can either turn and stretch the dough, stopping to allow the dough to rest for a few minutes if it springs back readily, or roll it out with a rolling pin. Either way, work the dough until it is about 1/4 inch thick (you can make it a little thinner if you prefer) and transfer it to the peel. 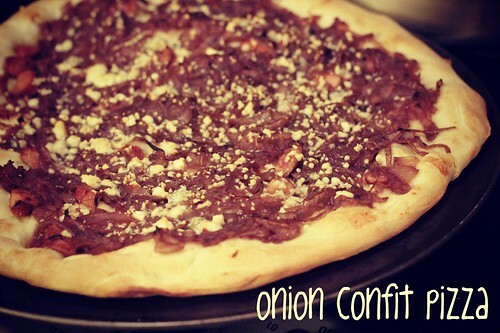 Topping and Baking Top with half the cooled onion confit and any or all of the optional ingredients, or the topping of your choice, leaving a 1-inch border around the rim of the pizza, and slide the pizza into the oven. Bake for 13 to 15 minutes, or until the topping is bubbling and the uncovered rim is puffed and beautifully golden. Repeat with the remaining dough and topping. 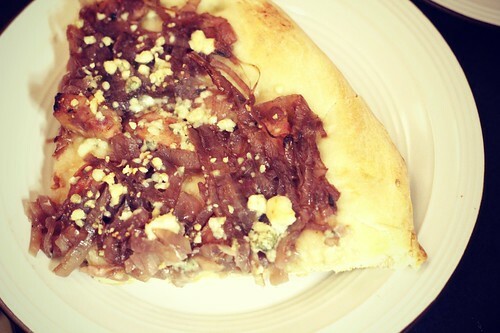 This entry was posted in Dinner, Pizza, Tuesdays with Dorie and tagged Baking with Julia, caramelized onions, dinner, Pizza, Tuesdays with Dorie by hilary924. Bookmark the permalink.